Women’s Health magazine is written for a new generation of women that want practical information on healthy living. This magazines publishes 10 different issues per year and provides tips and advice for integrating getting in shape and feeling good into their busy schedules. Health is another popular magazine related to womens health. It publishes 10 issues per year and suggest valuable tips to its readers. It eatures informative articles on how to stay fit, look great and feel fantastic. This Health magazine offers reliable information to help manage your healthy life. Shape is a highly selling magazine for women’s health. Here the experts provides advice on health and fitness issues like exercise, nutrition and psychology. Shape is a complete health concious magazine and publishes 12 issues per year along with tips to overcome this issues. Fitness is another well known women’s magazine, devoted to women’s total well-being – mind, body and spirit. It publishes 10 women issues per year and offers expert advice on fitness, beauty, relationships, health, diet and nutrition. Oxygen magazine is an ultimate guide into the invigorating world of women’s fitness. This magazine publishes 12 issues per year , dedicated to women who wish to better themselves through proper nutrition and exercise. 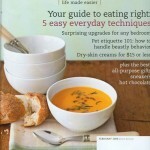 Real simple is another popular health magazine for womens. This magazine is about implifying your life, home, body and soul. This magazine, publishing 12 differnt issues per year, offers ideas for home, food, money, clothes, health, work, family and holidays in each issue. This well known health magazine for womens provides healthy solutions for weight loss and disease prevention to its readers. 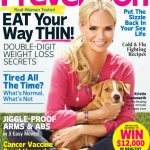 Prevention magazine has its readers all over the globe. Per year this magazine publishes 12 issues and experts suggests healthy tips on health, anti-aging, diets, nutrition, family, fitness and food. Self magazine is very popular American magazine for women, which provides tips on health, fitness, nutrition, beauty and happiness. This magazine is published 12 issues a year and experts provides beneficial tips on this issues. A very well known magazine for womens on health and wellnes. 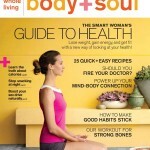 Body and Soul magazine publishes 10 issues per year , comes in easy to read format. 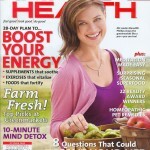 Natural Health magazine is a magazine about leading a healthy life, the natural way. This magazine publishes 6 issues per year and offers beneficiary tips on fitness, health, healing foods, home remedies, organic gardening and new products.